A high brightness 1000nit 5-inch HDMI monitor that’s perfect for vloggers, creatives and photographers. When you’re shooting video on mirrorless cameras and DSLRs, the Shinobi gives users the perfect view and is packed with the latest features, but is small and light enough to take anywhere – weighing in at a mere 200g (7oz). 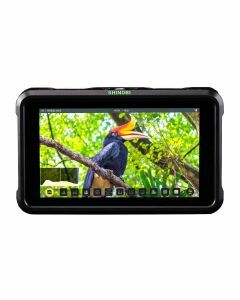 With a stunning 5” 10-bit HDR or SDR display, the Shinobi allows you to see your images clearly in daylight on the 1000nit anti-reflection screen. The sleek lightweight design is crafted for maximum efficiency and weighing in at just 200g, it is one of the lightest 4K monitors on the market, stealthily attaching to any HDMI camera setup. Shinobi utilizes our revolutionary AtomOS 10 platform and is packed with extensive suite of scopes and simple one-touch operations. Shinobi includes monitoring tools for focus, framing & exposure, including Focus Peaking, 4:1 / 2:1 / 1:1 Zoom, Zebra, False Color, Frame Guides, SMPTE Safe Area, Waveform, RGB parade, vectorscope, a new multi-view ‘Analysis Mode’ and a flexible3D and 1D LUT, Profile and Preset support (upload .cube files via SD Card) and options for anamorphic desqueeze monitoring. Apply and compare looks for post-production in SDR or HDR from your favourite LUTs for your camera or from your post team for consistency across shoots. The Shinobi allows you to load up to eight custom LUTs at anytime via the SD Card Slot and instantly select between them, maintaining creative intent at all times. At just £399, the Atomos Shinobi matches any camera level, and is one of the most affordable HDR monitors available today. Without batteries: 196g / 7oz. Compatible batteries: NP-F series and supporting accessories. AtomX or other. Headphone out: 3.5mm Headphone out 2ch. Monitoring Features: Luma Waveform, RGB parade, RGB Overlay, Vectorscope, Vectorscope Zoom, Histogram, RGB Histogram, Anlaysis mode (Multiview scopes: Waveform, Histogram, Vectorscope), Focus Peaking, Zebra, False Color, Blue Only Exposure, Zoom (1:1, 2:1, 4:1), SMPTE Safe Areas, Cinema Guides, Anamorphic Desqueeze.